Since the day the travel business has gone online, a few big players have started dominating the market. You simply can’t think of beating them. These giants spend millions on marketing and advertising and offer the rates that simply new entrants can’t match. Either you like or not, that is the way the things are today. When you want to start on your own, you have to fight with them with whatever might you have. Online searches are highly tilted towards the big giants. Whenever a vacationer hit the key, he gets directed to them. What can you do to catch the vacationers’ attention? Let’s learn a few strategies that will help you to fight with these giants. A few strategies are highly favoured by the new start-ups internationally. They are certainly going to help you stand on your own feet. Giant players offer great marketplace but they charge their commission matching their brand. If you want to compete with them, keep lower margin for yourself. It will create positive impression on your customer’s’ mind. They will remember you as a low price tour agent. Whenever they will have a need, they will approach you first. When you are unable to satisfy their needs, only then they will go to other agents. You will be earning less, but there will be less chance of getting into loss. The strategy will help you to hold ground. Design better travel plans and make them more valuable by adding some free goodies. While doing so, do not compromise on your margin, but try to stand out in the market. You know that your customers are going to compare your plan with other plans offered by other agents. Hence, you must stand out. That would enough to get you noticed. You won’t require to anything else. Once the buyer identify you, they will be forced to come to you whenever he has a travel need. The travel business is done online. You need to have an attractive and user-friendly website. Most of your customers will approach you through the website only. They would first visit your website and check out your offerings and then will decide upon visiting you in person. If the website is user-friendly and well planned, you will get good leads both in walk-in and emails. The content must be SEO-optimized. When a website ranks higher on Google search results, it draws more customers. You should spend time and money to get a good website. Optimize your site for mobile device and focus on customer trends. The Internet today is primarily used from mobile devices. Surveys show that handsome amount of users consume internet data first on a mobile device. Optimize your site for mobile & tablet devices and keep an eye on the customer trends. You need to adapt to it all the time. You should install an itinerary planning software or travel CRM. It will help you run your office with a less staff in much organised approach. Such software, popularly known as CRM, will help you plan travel itineraries and manage other activities of your office. 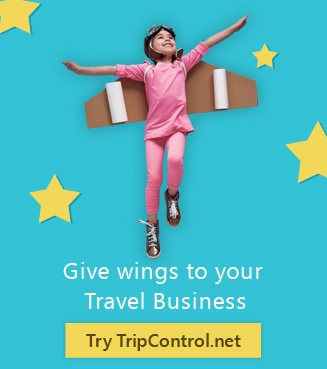 One of the best Travel Itinerary planner is TripControl (www.tripcontrol.net) – check their offerings and subscription plan as per your need and give it a try. Once a person comes to your office, try to get his contact details and keep contact with him on any pretext. You can send him offers, discount information, group tour plan or anything new that you explore and develop. The more you connect with your prospects, the friendlier they become. They are more likely to become your customers. When your customer come back from the tour, don’t leave them; connect with them after a few days and take feedback. If some issues occurred in the tour, solve that issue and inform them. If nothing can be done in that situation, say sorry and assure them that would never happen again. You will even get references from them. Customer loyalty is low in the travel business, but that doesn’t mean that customers don’t return to the same tour operator. If the travel plan is good and they had a positive experience, they are more likely to return. Obviously, you need to have great tour plans at the very first place, but you should also build a smooth purchasing process and offer good customer service right from booking to return. Subsidiary actions are also equally important. It pays in the long run. Go for social media engagement aggressively. Build a thriving and engaged community. Social media like facebook has millions of users. When your customers share their experiences on the social media, it increases your brand value and gets you more customers. Conversely, it can damage your brand also if your customers share their negative experiences on the social. Therefore, you need to monitor your social media page everyday and take appropriate action immediately as and when arises.